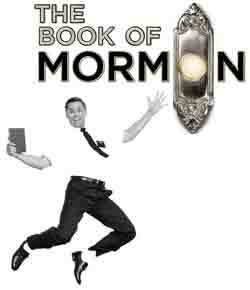 The Book of Mormon is a musical religious satire which lampoons organized religion and traditional musical theatre. It tells the story of two young Mormon missionaries sent to a remote village in northern Uganda where a brutal war lord is threatening the local population. The missionaries are very naive and optimistic and try to share one of their scriptures (the Book of Mormon) with the locals, but they are more worried about war, famine, poverty and AIDS. The musical currently stars Dave Thomas Brown as Elder Price, Steven Webb/Moroni/Elder McKinley,Tom Xander/Elder Cunningham, Dean Maynard/ Price's Dad, Richard Lloyd-King/Mafala Hatimbi, Leanne Robinson/ Nabalungi, Michael Moulton/ General and Nicholas McLean as the doctor with Oliver Jacobson as stand by Elder Cunningham. Book, lyrics and music are by Trey Parker, Robert Lopez, and Matt Stone. Best known for creating the animated comedy South Park, Parker and Stone co-created the music with Lopez, who co-wrote and co-composed Avenue Q. The show opened on Broadway in March 2011 winning nine Tony Awards and a Grammy Award for Best Musical Theatre Album. An original Broadway cast recording was released in May 2011 and became the highest-charting Broadway cast album in over four decades reaching No. 3 on the Billboard charts. Masterpark at Whitcomb Street. This theatre participates in the Theatreland Parking Scheme - find out more about the great discounts offered by clicking on the link. Hearing-Impaired infra-red system in the auditorium and induction loop at Box Office. Also occasional sign language interpreted performances. Guide dogs allowed into auditorium, or staff are happy to dog-sit. Braille and Large print programmes are available from the stalls kiosk for a £10 returnable deposit. Wheelchair spaces available. Companions can sit beside you. Whether you are able to occupy a theatre seat or cannot transfer from your wheelchair we have stalls available. Wheelchair access adapted toilets off the Stalls.